In August of 1925, the Thomas E. Wilson Co changed its name to Wilson-Western Sporting Goods Company after merging with the Western organization. In December of 1925 Wilson introduced cardboard tubes as containers for tennis balls instead of the paper wrapped balls and boxes previously used. These newly developed tubes were much like the cardboard tubes used in the United States during World War II, and were advertised with this statement: “We couldn’t improve the quality of the ball so we originated the Three-Ball, Moisture-Proof, parchment lined Tube container – a positive assurance of fresh, lively, dependable balls always. Insist upon Wilson Championship Tennis Balls in these air tight Tubes. These handy Tubes identify the balls and are your protection. Moisture Proof Tubes are exclusively Wilson”. Throughout 1926 and into 1927, Wilson continued to advertise the cardboard tube packaged tennis ball with the slogan “If they’re in tubes they’re Wilson”. In 1927 they first advertised their hermetically sealed metal pressure tubes as “THE GREATEST DEVELOPMENT EVER KNOWN IN THE HISTORY OF TENNIS” – but make no claim to pressurized cans being a Wilson exclusive. 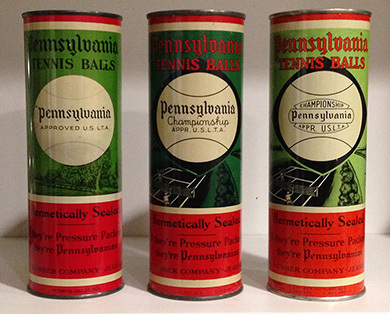 Plain (non-championship) Pennsylvania tennis balls are shown in hermetically sealed metal cans in several ads from 1926. A 1927 catalog offers the Wilson balls in a “new patented airtight metal tube” along with the new 1927 model Pennsylvania Championship Tennis Balls indicating that the non-championship ball was quite possibly from the previous year. Both Pennsylvania and Wilson produced cans with “Patented July 20, 1926” listed at the bottom. 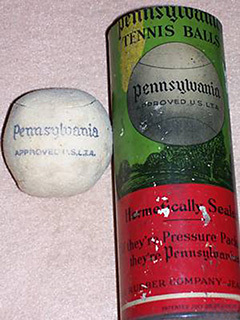 The Pennsylvania can also states “If they’re pressure packed – they’re Pennsylvanias” and “Pressure Packing, exclusive with Pennsylvania Balls, represents the greatest improvement made in tennis balls since the inception of the game”. So, the idea and implementation of three tennis balls to a tube type container was a Wilson innovation, but it appears that Pennsylvania Rubber Company was indeed the first to pressure pack and hermetically seal tennis balls in metal containers.